Many companies prefer an end of the year bonus or taking their staff to a lavish lunch to get the same results. 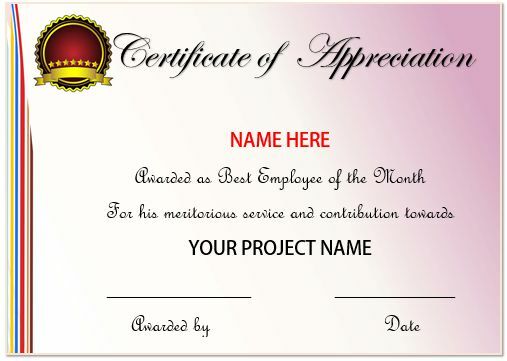 Both are expensive but employee appreciation certificates are inexpensive and yet serve the desired purpose wonderfully. 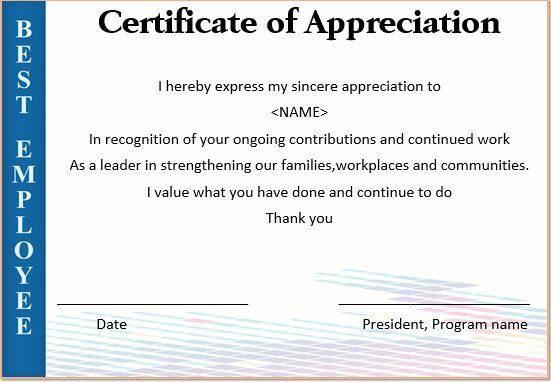 So, here we are presenting for you a nice collection of free certificates of appreciation for employees that you can download and print effortlessly. Please have a look and pick the one that you think is best. 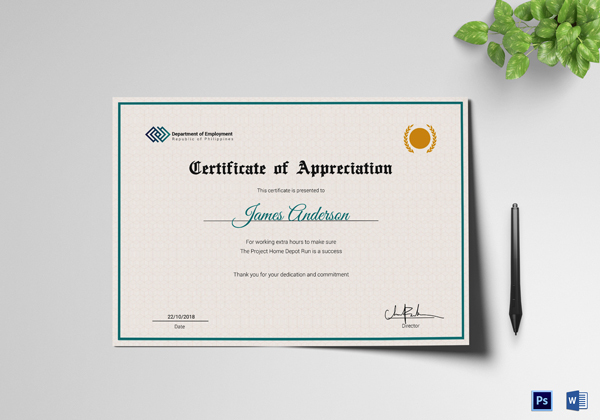 The appreciation certificate comes with an awesome design and color combination. The dark blue header and the beautiful font style enhances the look of the certificate to a considerable extent. Moreover, the cute illustration of a person dressed in a professional attire at the bottom-left with his fingers pointing towards the text looks more as an announcement of the achievements of your employee. The design layout of the certificate is divided distinctly into two parts. 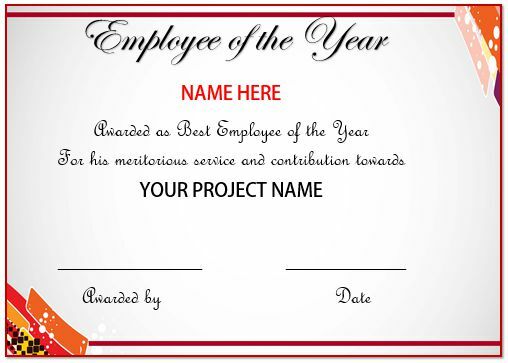 The left part consists of a vertical column in blue featuring the text ‘ BEST EMPLOYEE’ vertically and the right side consists of a white background with slanting lines of light blue and pink in an inconsistent manner to its bottom. The editable certificate is also heavy in terms of text details, aligned to its center. The certificate comes with a vertical column in blood red on which text is in contrasting white. 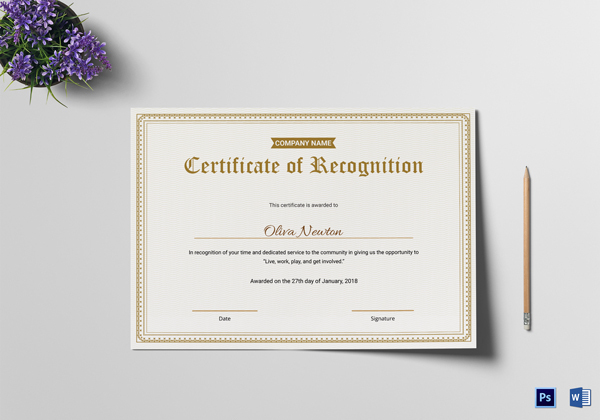 It also features a text box to its right that has adequate space to fill text details like the name of the person receiving the certificate, name of the person awarding the same and date. The best part is the dark red narrow border and the clutter-free design that catches the attention of any onlooker. The certificates come in a combination of gray and blue that obviously look very different from the rest. 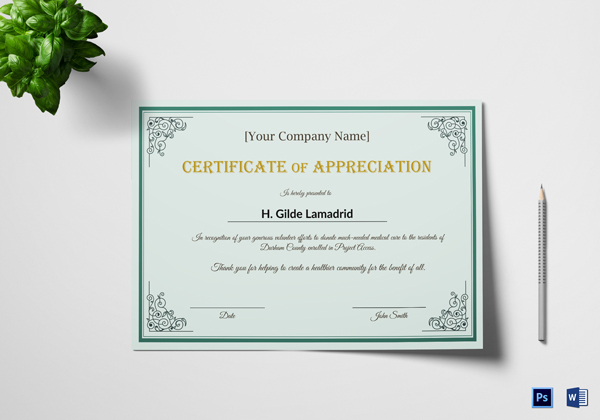 With dedicated space to type the recipient’s name in red and rest of the text in a decorative font, the certificate is attractive. A graphics in blue to its left resembling a curtain adds a certain charm to this certificate. Are you looking for ideas to value your employees? 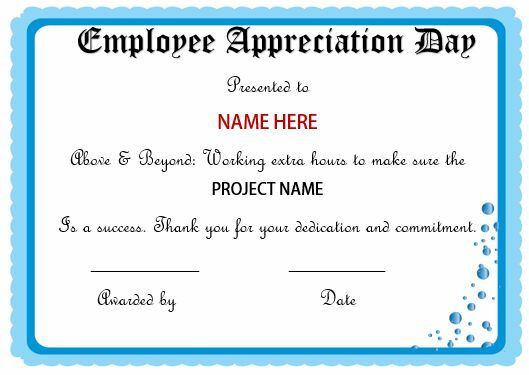 If yes, employee appreciation certificates can prove extremely handy. 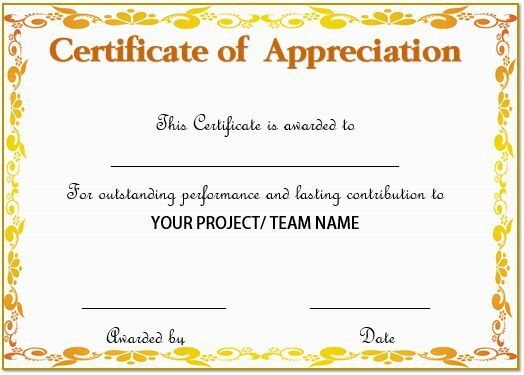 There is no need of any particular occasion to appreciate them and you can do the same throughout the year by giving such certificates in front of your entire team. 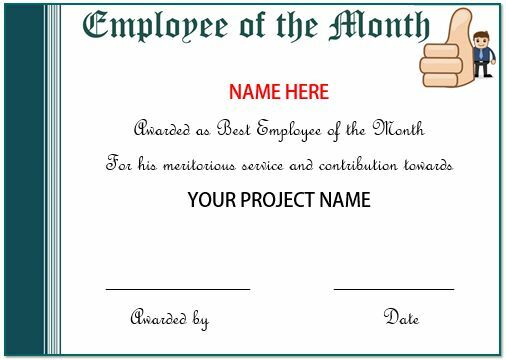 If you award them nicely designed certificates of appreciation, employees will feel valued and will get motivated to do work more diligently for your company. The certificate has a white background on which text is in black and red while the header is in dark green. The use of a wide column in green to its left and several vertical lines adjacent to it in the same color builds a good contrast. Moreover, the certificate also features an illustration of professional with his hand showing a thumbs up gesture. The certificates feature a red border around a light gray colored textbox consisting text and graphics. 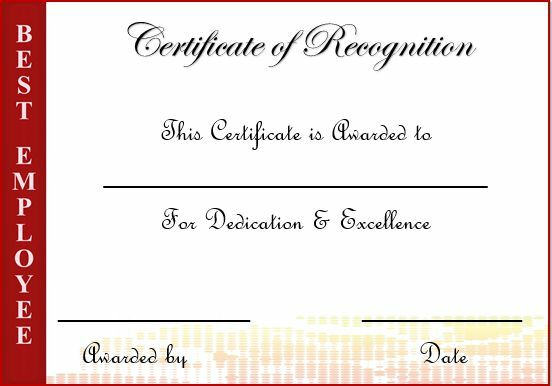 With a color scheme of red, yellow, and gray, the certificate features a good color contrast that looks soothing to the eyes. Moreover, the orange header and the four stars at an equal distance below the same makes it adorable. The certificate has a serene green boundary around a white text box at a little distance away from its four edges. 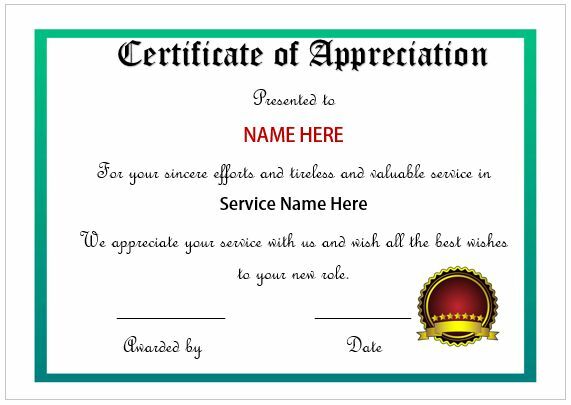 The beautiful choice of fonts for the header, and the appreciation as well as the attractive logo to its right-bottom are the major highlights of this editable certificate.There is also use of bright red for the inclusion of recipient’s name that builds a good color contrast. 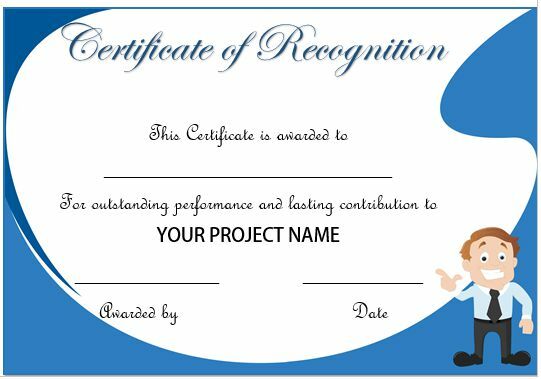 The certificate is aesthetically designed with the use of brilliant graphics in brown, orange, yellow, and blue. It also features a narrow brown border that gets wider at the top and bottom. The light background and the bright logo are the added attractions of the certificate that will surely steal your heart with its color-scheme. The certificate is an elegant one with a golden cup to its left -side on a light yellow background scattered with white stars and a splash of dark green at the top and bottom. The text in black provides the needed color contrast on a light green background while the recipient’s name in red attracts the eye. The attractive certificate has a very distinctive design layout with the use of circles of various sizes as the principal design element. Each of the circles has multiple sub-circles inside it in different colors like bright red, blue, and white.There is also a red horizontal line at the top and a border in changing hues of red that look lovely. 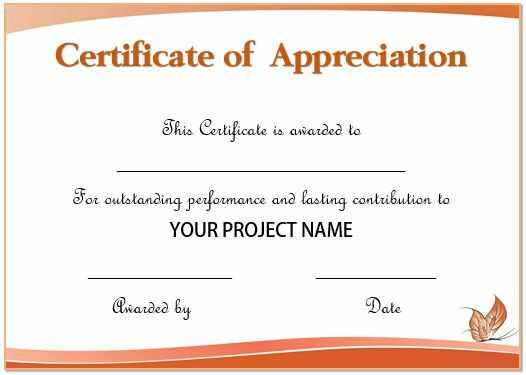 The certificate has a narrow red border around a light gray colored text box that feature interesting graphics at its two opposite ends i.e. to the left-bottom and the top-right in colors like orange, red, yellow, black and white. The rest of the certificate is simple with its text in traditional black and ample space to add other necessary details. The certificate has a good use of square shapes in its design. The design is in two parts i.e. the left one consisting a dark green background featuring a professional wearing a sky blue shirt and the right one consisting of a white text box. The squares are adjacent to the green column but are lying on the white text box. The green border considerably enhances its look. 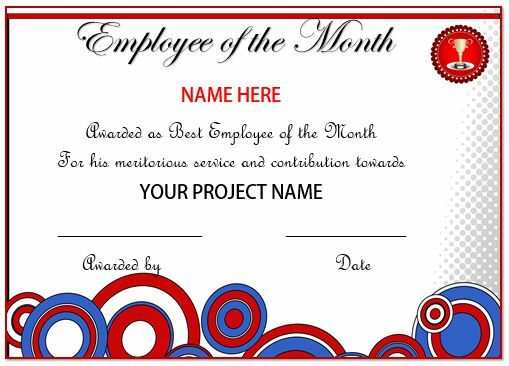 See the best collection of the employee of the month certificates in our article. 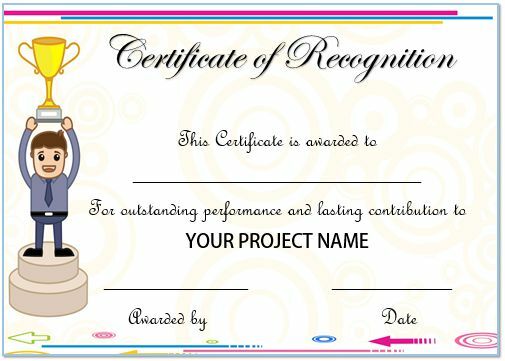 The blue border and an illustration of a professional holding a golden cup are the major attractions of the certificate. The blue border stands out as the text box is white with multiple pink circles as the watermark and thus offers the much need contrast in terms of color scheme. Yes, the use of horizontal lines at the top in bright colors also performs the same function and has increased the beauty of the above certificate. The design layout of the certificate is simple with minimal graphics at the top and bottom in contrasting red on a white background containing text in black. The major attraction is the large header in orange and an image of a cute butterfly having orange colored wings at the right-bottom. 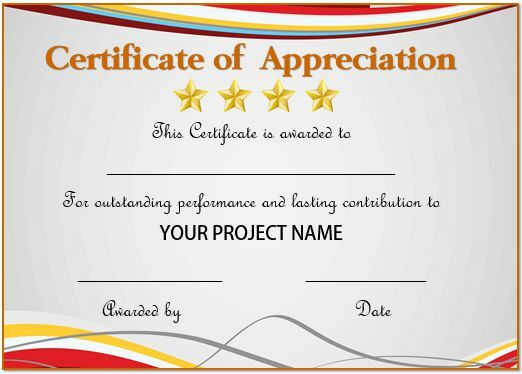 The certificate is editable to include your project name for which you are appreciating your employee. The certificate has a beautiful border in sky blue and a border in dark blue around a white background. There are also plenty of bubbles at one corner and a large, but attractive header in black. You can add the recipient’s name in red that creates a nice contrast. 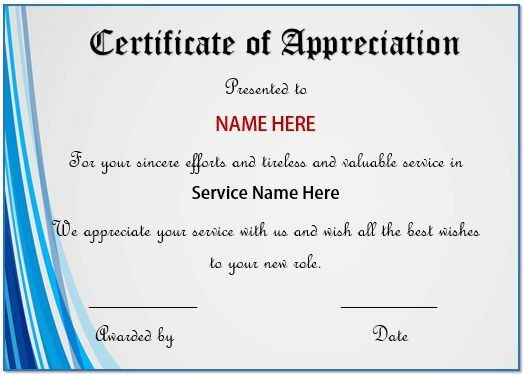 The combo of white and blue always look enchanting and the above service appreciation certificate is not an exception. The header is also blue here and the font style is eye-catching. The remaining text in traditional black on a white background looks simple, yet elegant. 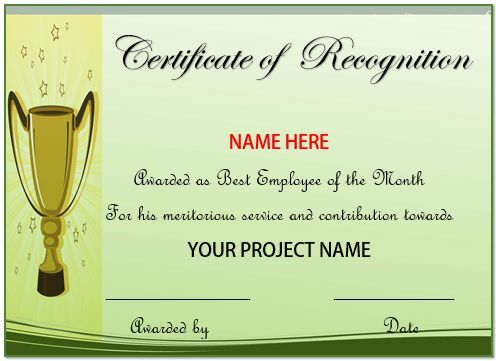 Check out our employee anniversary certificates here. 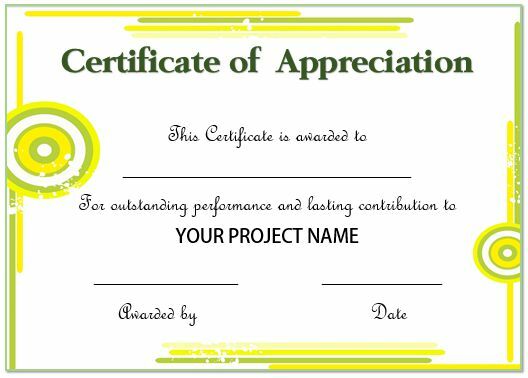 The certificate is a sophisticated one with a color combo of bright yellow and serene green on a white background. There are two circles with sub-circles adjacent to the green border at two -opposite sides while there are horizontal lines of different lengths at the top and bottom. The decorative motifs in golden on a white background forms the hallmark of this certificate. To add to its beauty is the header in orange and rest of the text in black. 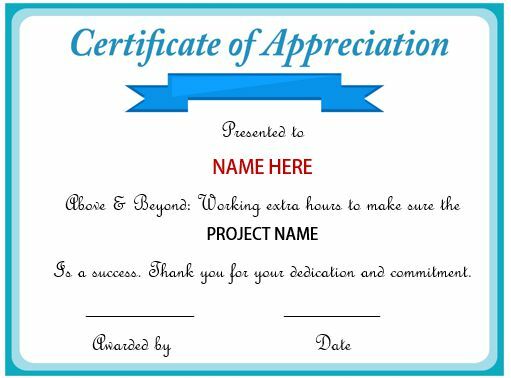 The certificate is editable and has dedicated space to include the project or team name. 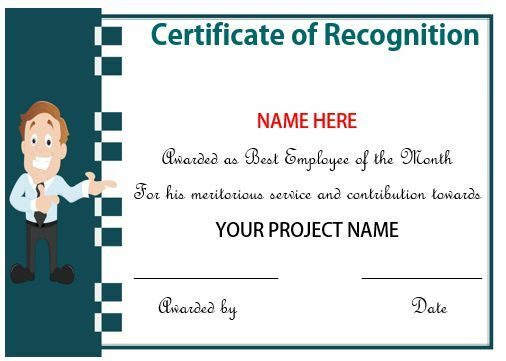 The certificate features multiple vertical lines in a myriad of bright colors like red, yellow, blue to the left of the design layout while the rest of the certificate is in baby pink. The recipient’s name in red and a logo in dark red at the top-left add more charm to the certificate. The design layout consists of a vertical column in gray on which decorative motifs are in contrasting yellow and a white background on which text is in multiple colors. 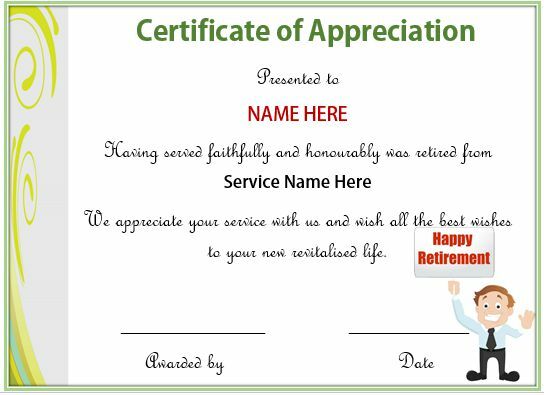 The certificate is perfect if you are looking for a certificate to appreciate your faithful employees who are about to retire from their services. Please share your opinions and views about our collection as we value you and your views to improve ourselves all the more. 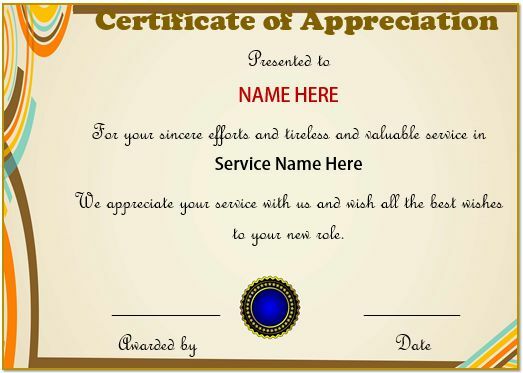 Feel free to check out the other free certificates and templates also that we offer.